Before a ball had even been kicked at the 2018 FIFA World Cup in Russia, star Egyptian striker Mohamed Salah was courted for a photo-op with Head of the Chechen Republic, Ramzan Kadyrov. Big international sports tournaments have been a familiar platform for countries to attempt to normalise global perceptions of themselves through overt displays of symbolism: in essense, co-opting sports for displays of soft power. This year’s World Cup in Russia has proved no different. Kadyrov has come under criticism from the international community and numerous human rights organisations due to repeated accusations of crackdowns on political opponents, as well as waves of anti-gay purges against Chechnya’s LGBT community. In recent years, Salah has attracted universal acclaim, not only for his success on the pitch but also for his passionate advocacy of progressive Islamic values and attempts to unify the Muslim and non-Muslim worlds. Kadyrov’s photo op with the poster boy for progressive Islam, and consequential gift to Salah of “honorary citizenship” of Chechnya, can be interpreted as an attempt to deflect from accusations of religiously driven hate crimes and concerns about the rise of Islamic radicalism in Chechnya. This kind of effort on display at the World Cup in Russia is a familiar tactic whereby nations accused of authoritarianism and poor human rights records attempt to appear more committed to an idealistic notion of internationalism. Most recently, this was also seen at 2018 PyeongChang Winter Olympics, where North Korea used the opportunity to normalise public perceptions of the regime through overt and fantastical displays of cheeriness and positivity by its athletes and Olympic officials. Furthermore, North Korea took the opportunity to appear invested in repairing its relationship with its neighbours to the South. The 2018 World Cup has created a similar platform. The always-contentious Crown Prince of Saudi Arabia, Mohammad bin Salman, clearly understands the value of a good photo op. Bin Salman, who has long championed his efforts to bring about progressive and modernist reforms in Saudi Arabia, was present at the World Cup opener to witness the Saudi national team take on World Cup hosts, Russia. 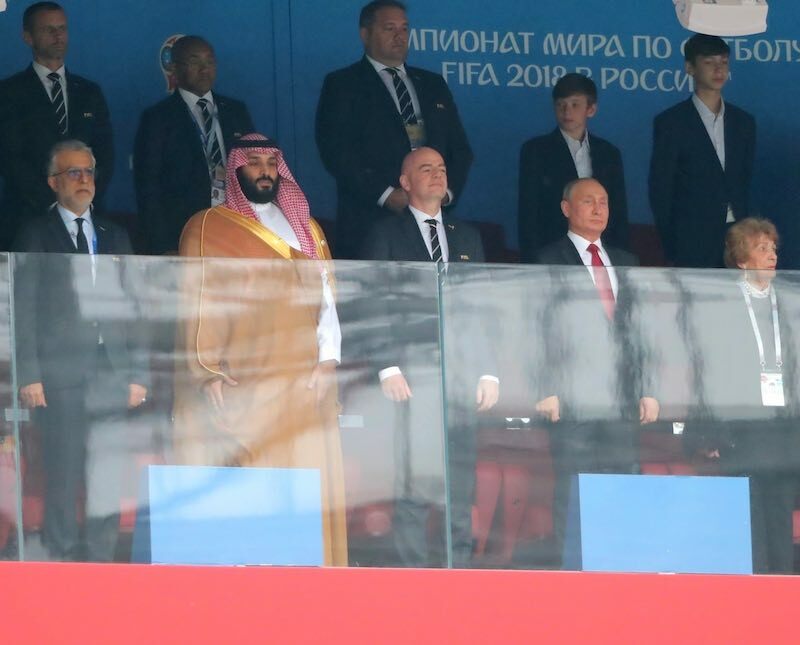 Bin Salman watched the game while seated next to Russian President Vladimir Putin, in a luxury box, offering an image of harmony for the sake of sport, the great unifier, despite hostilities against one another being currently played out in Syria. The Crown Prince’s trip to Moscow coincided with efforts by both states to stabilise and the boost the global oil production market in the wake of recent US sanctions on Iran and the collapse of the Venezuelan oil industry. This came at a time when Saudi forces continued their assault on Iran-backed Houthi rebels in the Yemeni port city of Al Hudaydah, amid a three-year conflict involving Saudi-led coalition airstrikes that have claimed the lives of more ten thousand people – half of them, according to the UN, being civilians. Despite images from the World Cup of pragmatic cooperation between Saudi Arabia and Russia, all this calls into question the authenticity of Bin Salman’s publicity campaign as a reformer within his own kingdom, and as a stabiliser within the international community. But mostly, the World Cup is a pivotal moment for Putin’s Russia as it attempts to promote itself as open for trade and investment, at a time when the Western liberal order is more fractured than ever. With accusations of election meddling, international assassination attempts, and human rights abuses within its own borders harming Russia’s international reputation, the World Cup provides an opportunity for Putin to promote his country at a time when trade sanctions are deeply hurting its economy. The World Cup allows Russia to give itself a PR makeover, presenting a mirage of stability and transparency that contradicts the actions of these regimes domestically and internationally.